Know about the difference between purified water and de-mineralized water and their specifications. De-mineralization is the process of removal of minerals from the raw water. All the minerals responsible for the hardness of water also are removed during the de-mineralization process. Anion exchanger containing anion exchange resins remove mineral with a positive charge and cation exchanger containing cation exchange resins remove minerals with a negative charge. Hence all the dissolved salts are removed by the ion exchange resins. These minerals are attached with resin and get removed from the water. This water is also called soft water because all the hardness is removed by the de-mineralization process. Generally, soft water is used in boilers to produce the steam because soft water does not create the problem of scaling in the boilers. 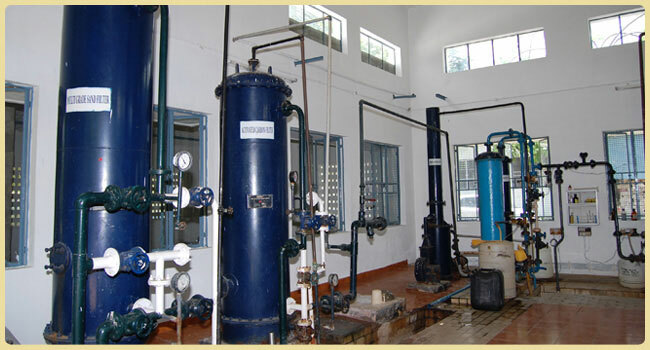 Soft water is also used to feed purified water plant. Purified water is highly pure water then de-mineralized water and produced using DM Water. To prepare the purified water, soft water is passed through Reverse Osmosis membrane and ultraviolet light. Reverse osmosis removes the soluble impurities from the water by passing water through its membrane having pore size 0.0003µ. Ultra Violet light removes microbes from water making it free from microbial contamination. Purified water is used for pharmaceutical manufacturing and to produce water for injection. Purified water is distilled from multi-column distillation plant and collected by the condensation process. Both DM water and purified water have their own specification to be passed for their quality. De-mineralized water should pass the hardness and pH test only while purified water has various parameters like description, pH, conductivity, hardness, heavy metal, iron, nitrate, sulfate, residue on evaporation, microbial limit test etc. I am working as a QC Manager in bulk drug API industry at Hyderabad. We have four Purified water plants and around 120 sampling points are installed (including generation points as well as use points). Please advice me how to reduce the purified water sampling points from routine analysis? Is there any guidelines of reduce testing on purified water analysis? Test only storage point and return loop point daily. And remaining point cover in fortnightly. Distribute your 120 point in fortnight basis. So you get daily 10 point analysis. Yearly validate water system test all point for 4 to 7 day.